Another episode of Sarah 101 and this time its a kitchen! Like I posted before, Sarah is brilliant at using Ikea cabinetry to create a custom look and this episode really showed off her mad skills. The "before" kitchen was every cook's nightmare... a very small space, lacking storage, and poor layout. It was a galley kitchen with an island parallel to the wall of cabinets. It was so tiny you literally had no room to move about if the oven door was open! I really didn't know how Sarah & Tommy were going to "fix" this kitchen. Once again, Sarah proved why she's the top designer by doing away with the free-floating island and replacing it with a peninsula (try for a dimension of 3'x5', she says) perpendicular with one of the galley walls. That small change really opened up the space, improved traffic flow, and connected the kitchen with the adjoining lounge, while still maintaining a bit of visual separation. Brilliant! The cabinetry was Ikea but some doors were professionally sprayed to give it a custom look. 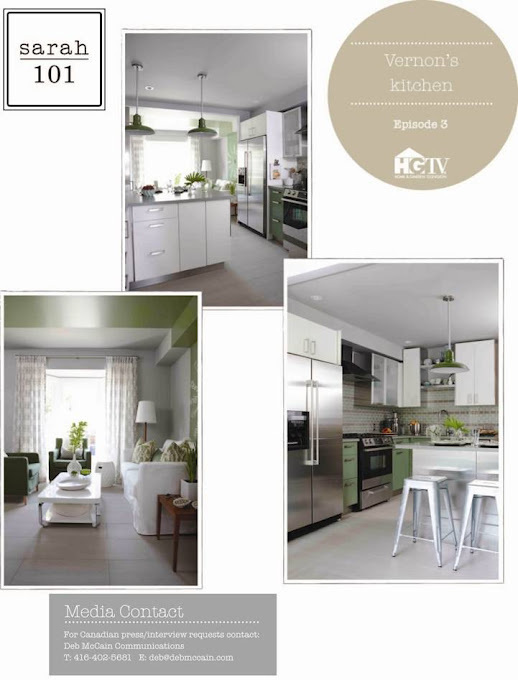 My favourite touches were the vintage pendants, the cohesive green & white palette in both rooms, and the emphasis on creating functional yet still stylish rooms. If you've been a fan of Sarah's since her "Room Service" show days, you'll be pleased to see she pulls out the old vinyl decals for a bit of old school DIY'ing too. Tie a colour in two adjoining rooms by using accent pillows. Further unite the spaces with the same flooring material. Every space needs softening. Do that with fabric! In a room with no architectural interest or details, do something to add some pop in the space. In this episode, Sarah put a vertical stripe which went up the middle of one wall, across the ceiling, and down the other wall. Unconventional and interesting! So, what did you think? Is the series growing on you? I wish this aired in the USA! I'm hanging curtain rods this week in my living room. How high and wide would you suggest? I liked this week's episode! Loved the self-depricating stance on design vs. price, it's great that Sarah always goes for a range of options. Thanks for the recap. I thought this room was the best so far. Loved the pendants. The way Sarah works Ikea is pure magic. The lounge really needed a carpet though. The home owners have a little one and that tile will be painful on small knees. 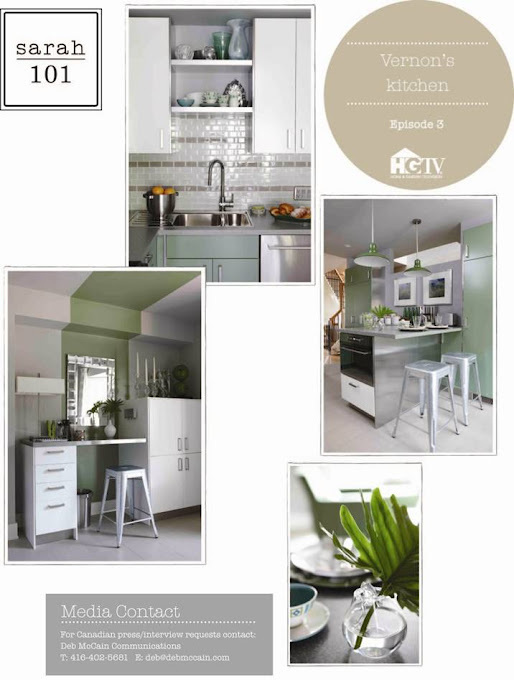 I do love the colour green and I know the show is trying to push the envelope with colour; however, I wouldn't want to live with green kitchen doors. A green Kitchen Aid yes, green fabrics yes but not fixed elements. Um, I like the kitchen in these photos quite a bit. The one on TV was MUCH brighter. These photos have definitely been desaturated by Sarah's people! I love her, but it felt a bit . . . . thin. Crazy grass green and white. Less depth than we've come to expect. That nursery last week was perfection. the green was a little much for me - i think you'll tire of it quickly. loved the vintage lighting and stools and the stacking granny smith apples! First of all, I wish the show would share the budget that they work with- I always wonder how much bang they get for their buck, as compared to what I get here. I liked everything in the kitchen (I L-O-V-E-D the clock idea- I may be stealing that idea for my house! )...except for the countertops. I HATED the countertops. I understand that you can't get more budget-friendly than laminate. We have laminate in our laundry room because we couldn't justify the cost of putting granite in there instead (it's the only place in the house we don't have granite counters)- but I think that laminate LOOKS cheap (as opposed to something being cheap and looking really good). Additionally, it's not heat resistant, and it can crack and chip. If you go with a granite or marble, yeah you're paying considerably more per linear foot. But it looks better (even if you get the cheapest kind), it's heat resistant, less likely to crack or chip and can be resealed if needed. And, it's one of those features that people are willing to pay for- you can recoup your costs if you decide to sell. I also think that stone counters are a more timeless look, whereas laminate can look dated (especially if you've picked something with a pattern). So, if you've used that countertop as your jumping off point for your backsplash and your sprayed cabinet doors and your accent wall paint, you're now stuck working backwards from several fixed elements to try and find a countertop that works, which makes zero sense to me. I love the layout of the kitchen. I think that's what I like Sarah the most, other than her use of fabrics and colors, is how she always manage to turn awkward spaces into functional ones. This kitchen is a clear example of that. I agreed with Wendy... the green is find with me for now ... don't know how long I will like it for. And as much as I like that wall clock DIY, I am not too sure about the band of green going up the wall and around the ceiling. Love the idea of the desk/office area hidden behind the kitchen. I would like to see the floor plan a bit more and perhaps in slower motion.. .so at least I can learn from how S+T have improve the layout (i.e. which walls have they taken down, where did they take out the railing). i still haven't had a chance to watch her show...gasp! i am therefore uber grateful for your little summaries. i like the freshness of the space but i do think I would tire of it. And the oven at the end of the island just seems strange. thanks for your recap - missed it last night - thank goodness for pvrs! p.s. We're heading up to Canada in a few weeks. EXCITED!!! I told my husband, "One of my favorite bloggers lives there!" I wanted to like it but I ended up really disliking it! I feel like Sarah is trying to hard to stray from her signature style that made her famous in the first place. The crazy green feels very forced. The shape on the laminate counters reminds me of quinoa! Poor Tommy, that kitchen was the furthest thing from his style. He's clearly just along for the ride with no design input! I love your recaps! Can't wait to see the episode. I agree. On the surface, all that white looks like Sarah, but it doesn't quite feel right. I think that maybe trying to apply a formula to design isn't working out because so often it has to be a much more fluid process. Becky - I think it depends on your ceiling and window height. If your rod is above a window, I like to put the rod about 1/3 of the distance from the ceiling to the top of the window. Jason - I didn't notice that but you're right! The green appeared MUCH brighter on TV. And I agree, a little thin, a little less layered/detailed/sophisticated than some of her previous designs. Kat - I think that laminate will date quickly too! Tim - more time showing the layout would have been good. I think that was the best thing about this episode. Kelly!! Ah, if only you were headed to Toronto :( Be sure to bring your toque! Krista - it DOES look like quinoa, lol. I liked it but I didn't love it, and I'd never do it in my house. I'm sure she was working on a budget otherwise there is no way a Sarah kitchen would use laminate. I'd do butcher block first... (though I don't know how much it costs). Also - not everyone can FIND a professional to spray their "big box" doors like Sarah does. I was truly hoping for an "off the rack" kitchen as that is what we're looking to do, but I couldn't replicate this given the customization she did to the doors. LOVED the clock, though. And I agree - the lounge area definitely needed an area rug. I think Sarah, along with Candice Olson, does an amazing job with Ikea. They seem to always use them for cabinetry and use a bit of woodworking to customize it. It seems like a great solution to high style at low cost.